As they say, the two best words in sports: Game 7! With the Meralco Bolts’ 98-91 victory in Game 6 against Barangay Ginebra San Miguel in front of a box-office record 53,642 fans at the Philippine Arena in Bulacan, the 42nd season of the PBA will end in a sudden-death war for all the marbles. The first Finals series that went all the way; your “titos” and “titas” would remember this game as perhaps one of the most explosive ever. The game was held at the Big Dome with an estimated overflowing 40,000 fans witnessing this epic game. Early in the second quarter, Toyota’s Oscar Rocha threw a right punch at Crispa’s Rudy Soriano’s face with the Redmanizers ahead, 27-18, clearing both benches and nearly creating a free-for-all. With the outcome already settled and Crispa safely ahead, 94-91, Philip Cezar made the final basket with a lane penetration against Ramon Fernandez but received an elbow dug. Cezar punched Fernandez, and another bench-clearing incident occurred, including fans who went down to the court. Stiff penalties were meted out, including a nine-month suspension for Rocha and four months for Cezar. This why that fabled rivalry is the best ever in PBA history. Considered as arguably the greatest Finals game in PBA Finals history, Toyota was safely ahead, 94-90, off a Francis Arnaiz looper with 16 seconds remaining. After a Wranglers timeout, import Aaron James knocked down an almost unmolested 18 feet jumper from the right corner to cut the lead in half. U/Tex then forced Arnie Tuadles to make an errant pass that was intercepted by Glenn McDonald who went coast-to-coast for a layup, only to be fouled by Arnaiz with two seconds left. McDonald cooly sank both FT’s to send the game into overtime. And with Robert Jaworski, Sr. already out of the game after fouling out in regulation, the Tamaraws couldn’t set their offensive plays well. With U/Tex playing solid defense, they won the game in overtime, 99-98. This memorable Finals series was the last between the two greatest rivals. It was a special Finals series as NBA top cops, Jim Capers and Lee Jones, were hired to officiate all five games. In the decider, Toyota held a close lead practically all throughout the game as Crispa import James Hardy, who had been playing listlessly in the entire series, remained ineffective. With the game tied at 97, Fernandez scored a twinner to push the Super Diesels ahead by two. Atoy Co, who was also struggling all throughout the series from numerous traveling calls made by the two American refs, committed another turnover, earning him a technical foul, which was converted by Fernandez. Co then made the same mistake, an offensive foul in the ensuing play, and with 80 seconds remaining, Toyota’s Andy Fields scored off Hardy in an and-one situation to give his team a 103-97 victory and the Open Conference title. It’s not uncommon to see great imports having off nights. But when it happens in a final game of the championship, fans often wonder if there’s any hanky-panky involved. This happened to Hardy in the 1981 Open Finals, then a similar issue transpired seven years after in the same tournament , this time featuring Purefoods’ David Thirdkill. One of the most ferocious imports ever to play in the league, Thirdkill’s game suddenly disappeared in Game 7 of their series against SMB, scoring only 16 points as SMB's frontline ganged up on him in the shaded lane. Purefoods playing coach Fernandez also went scoreless the entire fourth quarter and fouled out of the game with still a few seconds left. It was SMB playing coach Norman Black and Ricardo Brown who sealed the game for the Beermen, sinking four free throws for the team’s last points, giving them this monumental win against the young and talented Hotdogs. With the series going into a Game 7, Presto found itself in a major dilemma as their leading scorer and best player, Allan Caidic, was sidelined because of a hand injury. The Hotdogs were the solid favorites to win Game 7 but they didn’t expect the veterans of Presto to take charge. 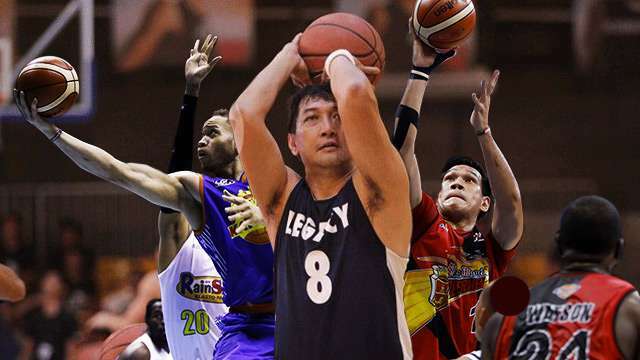 Arnie Tuadles, Manny Victorino, Abe King, and Willie Generalao combined splendidly to make up for Caidic’s loss. Tuadles scored 33 points, Victorino added 25, and King hauled down 14 rebounds. It was a shocking turn of events for the Hotdogs, especially since this was their fourth Finals loss since joining the PBA in 1988. When these two teams tangled once more in the Finals, the bitterness of Añejo’s Game 6 walkout the previous season still lingered. After four games, Shell was comfortably ahead, but a decisive 116-90 rout by Ginebra in Game 5 gave them momentum to knot the series in Game 6 with a 123-119 decision. In Game 7, it was nip and tuck, with Shell taking an early lead only for the Gins to recover and kept the game close. With four seconds remaining, the score tied at 102, Jaworski mapped out a play for Rudy Distrito to receive the ball from an inbound pass under the goal. Distrito received the ball, was forced to take an acrobatic, twisting jumper over the outstretched arms of Benjie Paras, but somehow converted the Hail Mary of a shot to go ahead, 104-102, with one second left. Shell’s last play off a timeout saw Ronnie Magsanoc’s three-point shot being swatted away by Jervis Cole to give Ginebra a miraculous championship. In one of the most emotional Finals game ever seen, the Llamados pulled off a stunning 90-84 victory in overtime against the Tropang Texters, but not after seeing B-Meg import Denzel Bowles scoring two clutch free throws with 1.2 seconds remaining off a foul by Kelly Williams. Down to 12 seconds remaining, James Yap missed a floater but regained possession with an offensive board and whipped a pass to Bowles who got nudged by Williams. 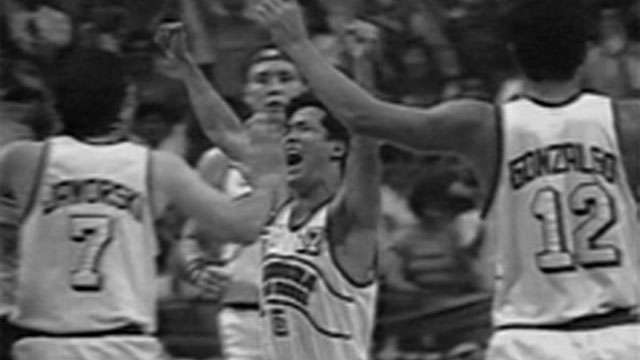 After his freethrows sent the game to overtime, Bowles took over the offense to ensure B-Meg's win. This was a heated Finals series that had several side stories, in particular, the clash between RoS coach Yeng Guiao and TNT's temperamental import, Ivan Johnson. Game 7 turned out to be special, needing two overtime periods to settle the outcome. In regulation, RoS import Wayne Chism buried two three-point shots in the last minute of the game to knot the count at 97. In the first OT, Chris Tiu set up Paul Lee for a layup with 45 seconds left, sending the game into overtime anew. In the second OT, Jayson Castro split his FT’s with 19 seconds left, giving TNT a 119-115 lead. Lee countered with with a trey from the right flank to cut the lead to one. Larry Fonacier was fouled and sank both FT’s but TNT opted to foul Lee with three seconds left instead of making him go for a tying shot. He sank the first, deliberately missed the second, but Johnson grabbed the rebound and came away with a heart-wrenching 121-119 victory over the hard-luck Elasto Painters. This was a rematch of the previous year’s Philippine Cup won by the Beermen in seven games. But it seemed that the Aces were hell-bent on exacting revenge, racing to a 3-0 series lead. But SMB’s championship smarts was on full display from Game 4 onwards as they won the next three games. In Game 7, SMB took a slim 43-38 lead at the half then exploded in the third, leading 68-51, while holding down the Aces to just 13 points. The Beermen coasted along from thereon, and while this Game 7 wasn’t exactly as epic as the others above, it was significant because SMB became the first ever in PBA history to come back from a 0-3 deficit to win the championship.